Hear the engines revving and the roar of the motor! 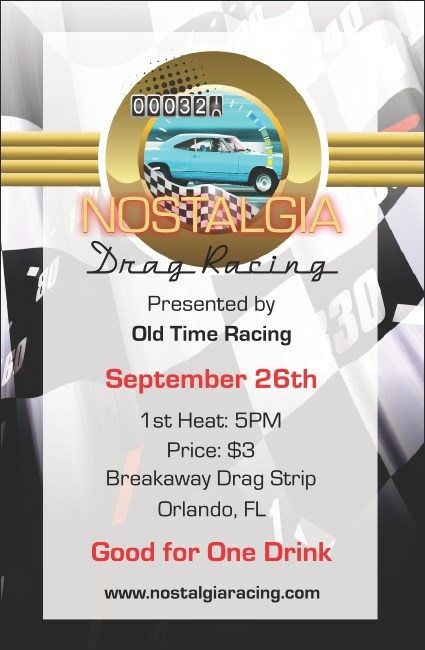 It’s time for a classic drag race! Your attendees are sure to be thirsty, but don’t want to miss a minute of excitement! Help them out by selling drinks early! With it’s speedometer border and classic car background the individually numbered Drag Racing Ticket is the perfect choice for your event. Three, two, one, go! With so many great design options from TicketPrinting.com, your next event is sure to be a success!